Pep Guardiola and Jose Mourinho are set for their second meeting of the season after the EFL Cup quarter-final draw pitched Manchester United and Manchester City against each other at the Old Trafford. However, that wasn’t the only humdinger thrown up by the draw for the Last 16, with Liverpool set to host Tottenham and Chelsea travelling across London for a right old tear-up with West Ham. Elsewhere, Arsenal will play Reading at the Emirates, while the fourth of four all-top-flight clashes sees Southampton host Sunderland. 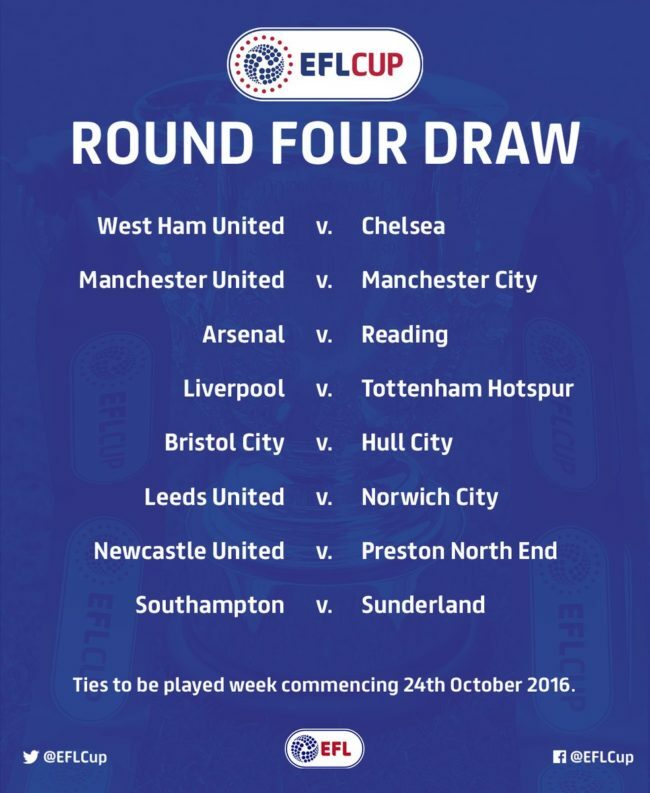 The ties are to be played week commencing 24th October. Although we’re not sure Mourinho will be too thrilled about another Manchester derby so soon in the season, after the Red Devils were well beaten by City earlier this month, also at Old Trafford.